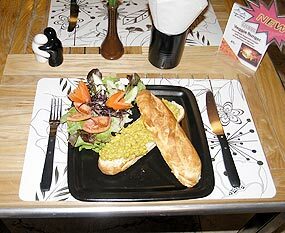 The Galae Thong Bistro is an attractive restaurant that takes up most of the lobby of Galae Thong Tower. If it weren’t for the banners creating an artificial ceiling, you would be looking up 20 or so floors through the centre of the building. It is very open on the sides as well, which creates a pleasant breeze on the rare occasions that Chiang Mai actually has wind! Seating is arranged so that you could come in for lunch with your laptop, to take advantage of the wireless internet service and finish with coffee on the sofa, or arrive as part of a group of eight and spend the evening enjoying Belgian beers and hearty food. Whether lounging or dining, you’ll experience attentive service and a varied menu. If you enjoy eating something special, you should come on Fridays, as ‘Mr. Stig’ (the man running the show, not the tamed racing driver) and his Thai cook experiment with mixing European and Thai cuisines, exposing his diners to the new fusion creations every Friday on ‘specials night!’ For those who have trouble making decisions and usually order ‘what the chef recommends’ – every week there’ll be something new! ‘The Stig’ comes from Belgium where he originally trained and became experienced. During a brief conversation about recipes he plans to try next, it was obvious he was using a “why not?” approach in mixing culinary styles from different countries. 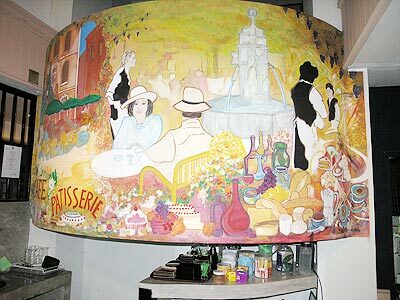 At first glance, the Galae Thong Bistro seems to cater mostly to residents in the condominium. They probably do room deliveries as well... Between lunch and dinner you’ll find two odd people highly involved with their computers, taking advantage of the free wireless access, but when suppertime arrives, the aroma of steak wafts from the kitchen and the coffee lounge transforms into a proper restaurant where you can order a glass of wine with your meal. The menu boasts a variety of western and Thai food; on our latest visit, my two friends and I chose western food, I ordered the Flemish stew (125 baht). They tried the goulash (125 baht) and Peekesstoompmetworst (a very long name for sausage, mash and carrots) at 95 baht. We washed the food with quite a few large beer Singhas at 70 baht each. As one of the house specialties is pancakes with various toppings (extremely good value between 45 baht and 60 baht), we decided to forego the blueberry cheesecake and go for them. When the bill came it was 400 baht per person, including a nice tip. Bearing in mind the amount of beer we consumed, it seemed like great value for money. A simple dish this week and one that is traditionally Thai. The filling can be chicken, pork or prawn, but chicken is my favorite and is the one presented here. It is not a difficult dish to prepare, and my local stall makes it in under five minutes. In a wok put one tablespoon of oil and heat. Beat the three eggs with the fish sauce and pour quickly into the hot pan, swirling the omelet mixture to produce a thin layer all over the pan. In another pan (or wok) put in the remaining oil and heat quickly. Add the crushed garlic then the chicken. After one minute add the tomato and onion and the sugar and stir for another minute. Finally mix in the tomato ketchup, the shallot and soy sauce. Replace the first wok on a low heat and gently spoon the chicken mixture into the center of the omelet. Fold over the edges to make a square parcel with the chicken mixture inside. With an egg slice scoop it out of the pan, garnish with chopped coriander and serve immediately.